Jordan baseball player Christian Hurtado and his family need your help, Long Beach. Renderings courtesy of Tetra Tech and Perkins+Will. The revitalization of the Los Angeles River is moving forward as, following its creation by State Assemblymember Anthony Rendon nearly two years ago, the Lower LA River Working Group has compiled a draft document highlighting proposed changes. While the overall project will offer some 81 miles of street improvements along the river along with 22 bridges getting updates as well, Long Beachers might be most enthused with proposals the group has for the stretch of river along our home turf. Long Beach’s part of the river is soft-bottomed—meaning it exudes the most natural looking stretch of the river’s lower extension. That also means the most possibility with connect river-goers to nature itself with floating boardwalks that extend across and over the soft-bottomed channel, protecting the environment from disturbances while allowing visitors to experience the flora and fauna directly. These boardwalks will criss and cross along the extension of the river, including under a proposed bridge park at Hill St. that will be elevated above the river so visitors can have high-reaching views of the river’s entire southern extension. Additionally, channel improvements like amphitheater-style pedestrian hangouts and bike path improvements are being proposed. Speaking of the bike path, a multi-modal path will replace the famed bike path; this ultimately means more accessibility as the path will cater to pedestrians, bicyclists, differently abled bodies, and even equestrian-minded enthusiasts. The river has long been the contention of environmentalists and urban designers alik: one man even proposed a way to connect the large gap along the bike path that bicyclists hit at DTLA while Golden Road, long before it sold out to macro beer, helped raise money for the revitalization by creating a special brew in honor of it. And the same kind of care and creativity went into the stretch of the river that runs through Long Beach. Former director of Long Beach Park, Recreation & Marine Phil Hester sat in front of a bunch of urbanerds and bicyclists, pedestrian-oriented folks and designers, and discussed an idea that is both brilliant and needed on a community level: the 2002 RiverLinks projects. RiverLinks would vastly use the underused L.A. River by connecting the west sides of Districts 1, 2, 6, 7, 8, and 9 to the river via biking/ped/green utopia. “Underutilized” is putting it nicely: the Long Beach stretch of the river could provide hundreds of acres of much-needed park space in a city which has a shoulder-shrug of a number when it comes to park space per resident. Citywide, Long Beach has about 5.2 acres per 1,000 residents. Even worse, when we examine the Westside—precisely where the LA River sits in Long Beach—we hit depressing numbers: 1 acre per 1,000 residents. That’s less than a football field of park space for every thousand people, prompting me to ask you to imagine shoving one thousand people onto a football field and telling those people, “Okay, now play!” The more affluent Eastside, on the other hand, has a beyond-awesome 16.7 acres/1,000 residents, far beyond the legal definition of a Healthy City, which stands at 10 acres of park space per 1,000 residents. 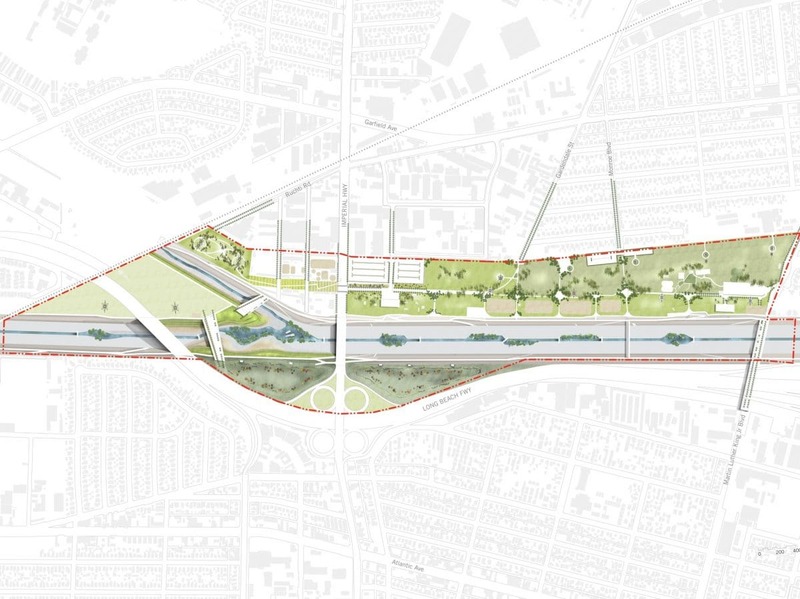 Editor’s note: there was a rendering originally included that was part of the draft plan; it was a concept bridge from another municipality used as a placeholder and one we used as an example in the article. Designers and writers of the draft felt this would confuse readers and insisted I use another image—which I did.